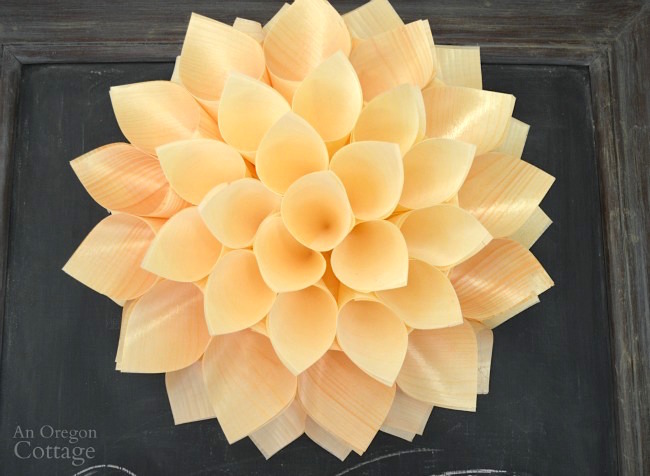 Craft a simple wood cone wreath for the fall that resembles a flower – cones, a glue gun, and poster board are all you need. 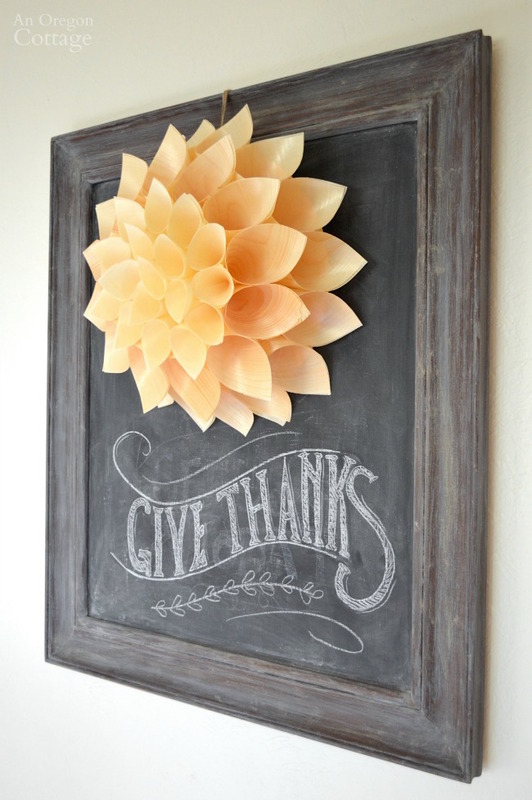 Add it to a chalkboard with a simple “give thanks” for a pretty Thanksgiving Chalkboard. Well hello, friends! How are these weeks before the Thanksgiving holiday going? 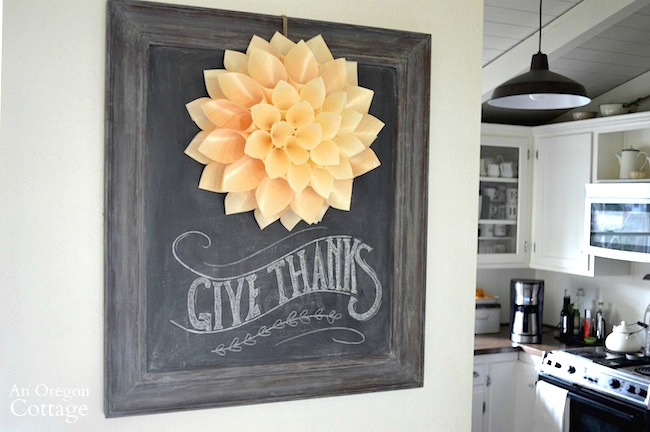 I thought I’d pop in and share the quick way I updated our chalkboard for Thanksgiving. It turned out to be a wonderful way to help us remember the things we have to be thankful for as we look to the holiday. 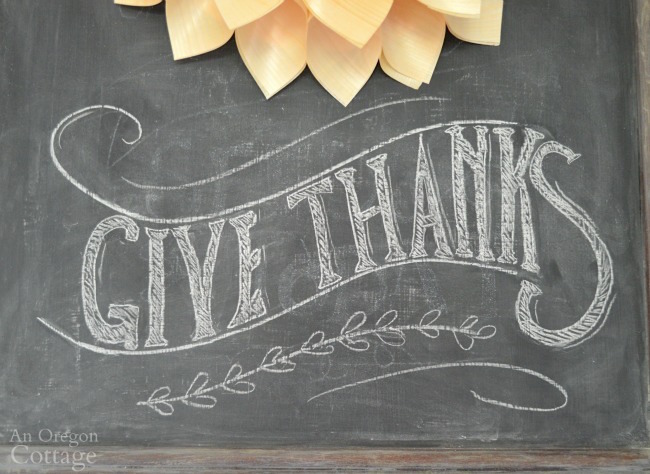 I love how Thanksgiving sort of forces us to slow down and not get all caught up in Christmas preparations before sitting down to be thankful for our family, friends, while looking for areas where we can practice gratitude. That’s what makes Thanksgiving special, so I like to give it a fair shake, even though in the blogging-Pinterest-world Thanksgiving seems to be glossed over in favor of Christmas. Well, not in my world – so I made this simple blossom-like wreath out of wood cones (which I think are made for serving appetizers at restaurants or something) which seems very harvest-y to me. 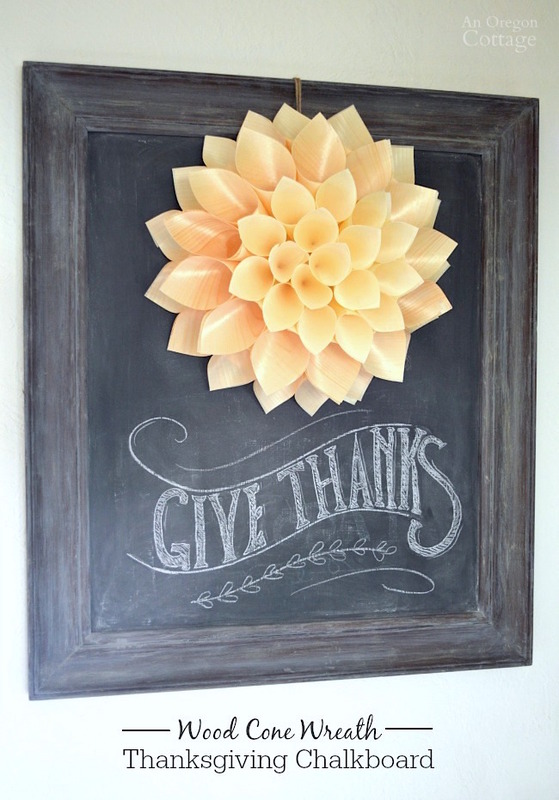 Then I found a thankful chalkboard phrase that I adapted from a Google search (which I can’t find again to link to – but it was a large chalkboard in a school and I just grabbed the ‘give thanks’ part) to make our sweet Thanksgiving chalkboard. Note: I didn’t know what a ‘floral craft ring’ was and since it was simply used in the MS tutorial to keep the poster board from bending from the hot glue, I decided to use thicker foam board. The wreath I made is a lot smaller than the MS version in order to fit on my board (12″ vs. 18″), so I needed to adapt it a bit. I cut out a piece of poster board in a 12″ circle, attached a piece of jute twine through the board to act as a hanger, and started gluing. I ended up using 2 rows of the larger cones, which were a slightly darker color, and then using the smaller, lighter color cones to create the center rows. I really like how it looks like a blossom, don’t you? That’s basically it, alternating rows and pushing the cones in with glue to make it look full. If you want to make a smaller wreath like I did, use the 3″ and 5″ inch cones instead of the larger sizes suggested in the MS tutorial. 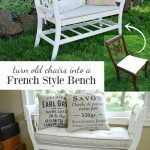 They’ll make it a lot easier to get the rows like the original. Once the wreath was finished, I used the jute twine and taped it to the back of our chalkboard so that it hung in the upper half. Since I’m not a great font drawer at all, I looked to the internet to provide an example I could adapt. Being able to refer to this as I’m drawing on the board is so helpful. I can usually recreate it to some degree and be happy with the results. It’s a chalkboard, not fine art, so I’m good with the imperfections! I urge you to do the same unless you are gifted in that area. There are so many great examples to choose from. Pick a phrase that has meaning to you and just go for it. I’m super happy with how the whole board turned out. 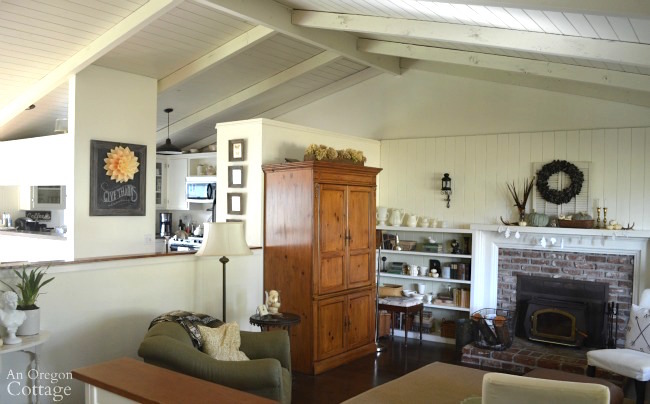 And since it can be seen from all areas of our great room, it’s the perfect reminder to give thanks in all things. I hope you all are able to take time and reflect this season that there is always something to be thankful for – always. That is what I will be doing, friends, in this time of world uncertainty. Thank YOU for hanging out with me and taking the time to stop by!! Your wreath is lovely, as is the ‘Give Thanks’ display. The wood cones are a new one on me, but I will have to search them out. 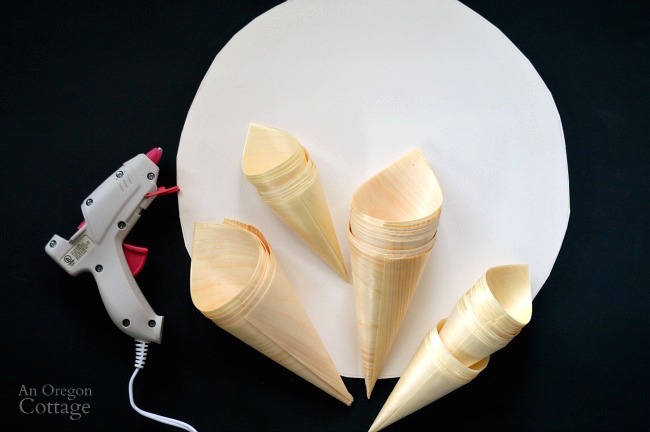 They were new to me, too, Suzanne – now I have to figure out what to do with 40+ wood cones leftover, ha! I made three different sizes of these for our daughter’s birthday one year out of scrapbook paper, but the wood cones are SO cool!! !